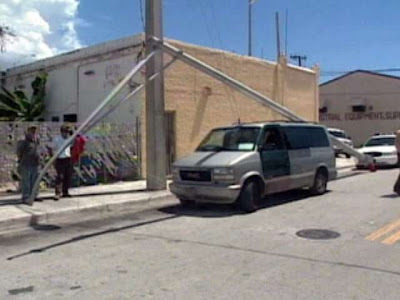 Last week, a man in Miami, FL was arrested for stealing an unusual item: a 40-foot street light that was owned by the Florida Department of Transportation. Elio Valero, 42, said that the light pole was laying next to the road. So, of course, he strapped it to the roof of his mini-van, tied red flags on each end of it and drove it 40 blocks to a recycling plant. Unfortunately for Elio, a minivan driving down the road with a 40-foot long light pole attached to the roof is not very inconspicuous. The police pulled Elio over just a few feet in front of the recycling station... and placed him under arrest for grand theft. Elio defended his actions by saying, "Hey, if I'm doing this to recycle, everybody else should do what they #&@% need to." Interestingly, while the police were outside the recycling plant placing Elio under arrest, another man, Joseph Moniz, was caught wandering into the plant trying to sell a manhole cover. He was also arrested.